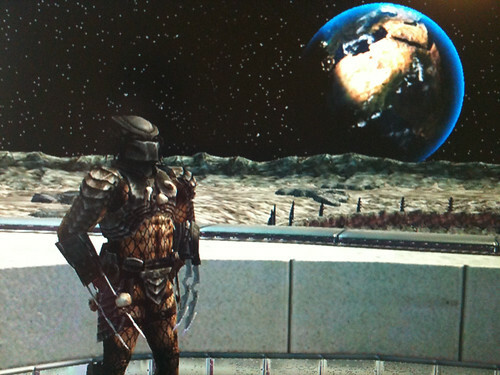 I ended up back in PS3 Home again this weekend, mainly to take my predator AV for a walk again. There were some significant updates. Most notable was the XMB style navigation replacing the graph paper and tiles map that we had before. It is certainly quicker, though had a hint of Fisher Price about it. 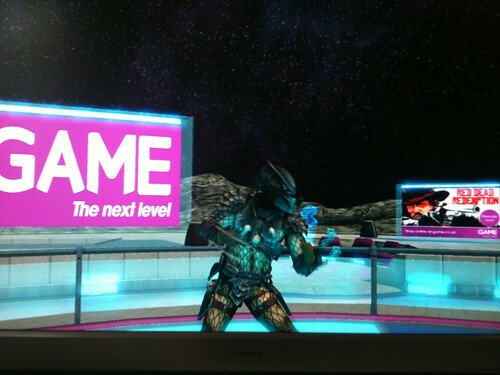 GAME stores in the UK had a brand new space, primarily about banner adds and game trailers, though they had a hop across some buttons mini game that is really hard to complete, but if you do you get a spacesuit AV to show off. 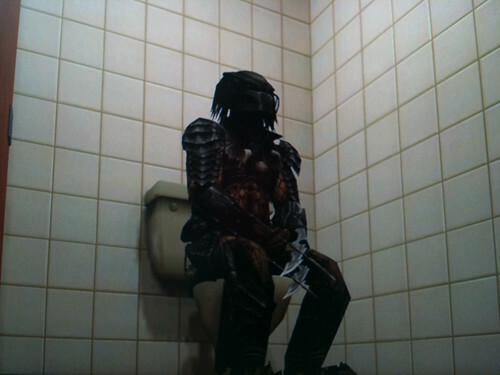 I had a great encouter with a fellow Yautja. Of course with these custom AV’s there is very little personalisation. However we stood and kind of gestured and bowed and saluted followed by some take turns break dancing. A funny moment. More important than the game space though were some purchasable more dynamic “apartments”. The basic lost apartment or treehouse are ok but you cant do much with them, the odd bit of furniture, and as far as I know in Europe we are not trusted to share our own photos and videos in our rooms. Which makes them…. well… pointless and boring. 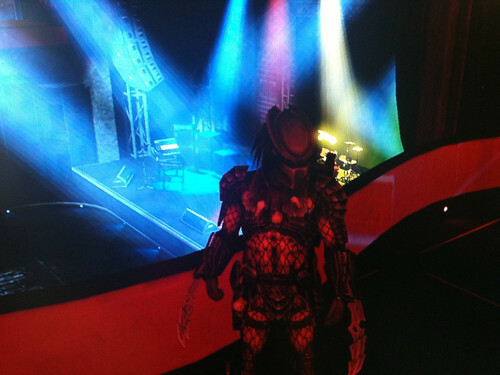 The first one I tried was a nightclub, a large space called musicality. This space has a stage with 4 sets of instruments on it for you and friends to mix sequences and loops. 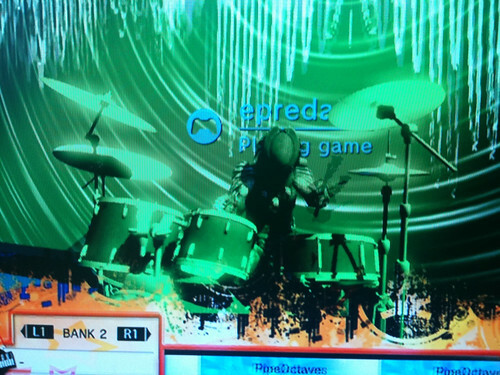 I quite like these sort of multitrack music sequencers so having a multiplayer version is great. I have not spotted how to buy the extra sample packs but the space does include a t-shirt shop. Some interesting integration. The next space that turned up is a London Pub. Which does what it says on the virtual tin. Its a bar, seats, fire dart board and toilet. Some nice animations out through the window with some london red buses zooming past. The darts games and wall mounted tv for high scores and friends scores is a great touch. It also featured a built-in web browser at the till behind the bar and you can ring the bell for time. 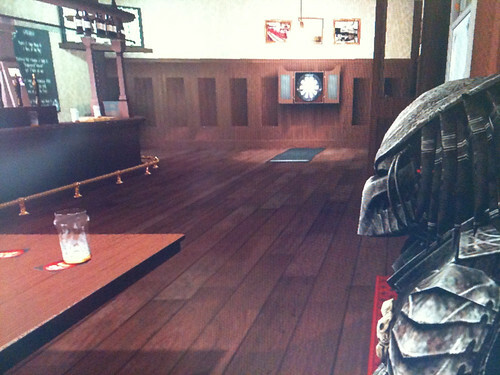 It was of course interesting and amusing to find myself doing this in a virtual world. Maybe there is an interesting future emerging for Home now, though they should hurry up I think. One final great change is that the standard movie theatres in the main square now are real spaces. Previously you entered and a flat screen showing some seats just blocked the view of streaming video. It was very poor. Now it is a space, with seats and you can sit with people, i.e. a shared experience at last! Ask me another – Avatar Quiz games wars. 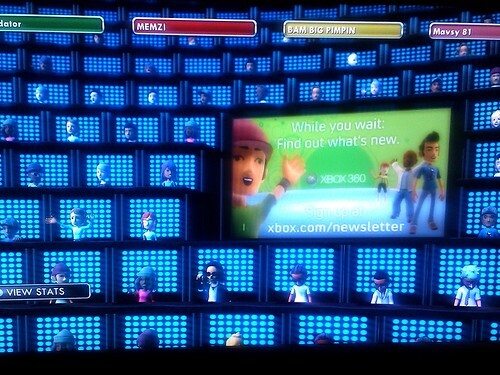 I recently got some time on the new avatar based quiz games on both the Xbox 360 and PS3 Home. Both of these are significant in bringing console casual gaming to a wider audience. They also have a slightly different flavour in how the Avatar represents you in the game. First up is Buzz on Ps3 Home. Something to do in Home is always going to be interesting. There have been some great events, the ARG Xi but they are only fleeting, or like Xi very involving but run for a short time. Buzz takes the multiple 4 question format that has appeared on the consoles and even in a schools edition and drops it into Home. It has always had a TV game show format, but in many ways that is dropped in this version. You do go to the Buzz studio and there are hints of TV, but essentially you and all the other players use their avatar position to decide on an answer to a question. It is very Crackerjack “Runaround Now”. There is a dynamic that if you don’t know the answer you can sort of “ask the audience” except the audience are the other players. In Second Life terms this would be the green dot effect. Flock to the crowd as they may just be right. There is very little ability to see you avatar or those of others as most of the camera work is based on the buttons of th game as above. However sometimes it zooms into the right answer and you may see yourself and have time for a little dance. I am in there somewhere with Blue (as still not allowed green) Spikey hair. The other quiz fest is on Xbox Live and called 1 vs 100. This goes for an even more TV game show theme and pits you against the crowd to out average everyone. 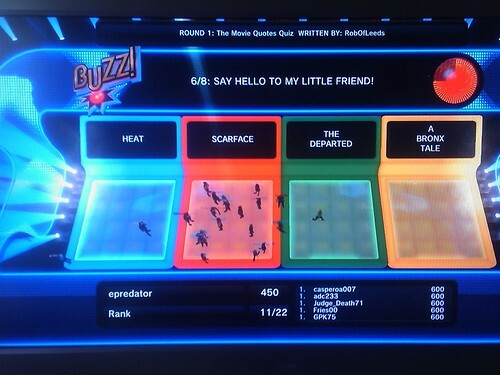 The screen shows the questions and answers, but unlike Buzz it is read out by a hosts voice. This makes it feel more connected I think. Also as you answer you get to level up and earn streak points that convert into tokens that let you skip a question every now and then. It is designed to be a live game show experience too. At scheduled times there is a real live game show host (Taking it into the territory of those late night phone in quiz shows, but hopefully not to tacky 🙂 ). The really live shows have prizes so that makes it more intriguing. So Buzz has what seems to be user generated quizzes, is quite quiet and the expression of the avatar is lost into using position, but giving an interesting wisdom of crowds dynamic. 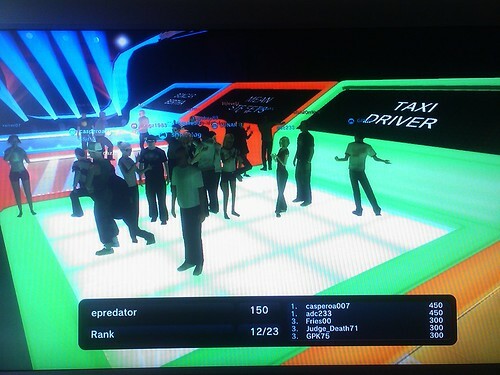 1 Vs 100 puts your avatar in a little booth, but you do see the others playing and it feels you are in competition. No doubt party play and other friend features will come into play as it grows. It is a long game (30 mins) to schedule into the day but it feels more exciting I have to say. A welcome (and free so far) edition to both consoles I have to say. I just got to see this video from E3 with Peter Molyneux from Lionhead and the wonderful Project Natal gear that seems to work already, though you can never quite tell. This however combines some Artificial life into the mix and Molyneux speaks about how everyone feels the immersion, picking things up, handing things over. There is of course an element of escapism required, but all our media requires that. Enough cues though and the brain engages, as with the few degrees of tilt on a fairground simulator, combined with a rushing video, the sense of speed, g force and braking becomes far greater as several senses are fooled at once. So not only have we had the toe dipped in the water of removing the standard game controller, the rise of the Wiimote, the drums, guitar and microphones of rockband and guitar hero but we now also have gesture based computing, realtime on consumer entertainment platforms. Whilst these are for pure entertainment, as the Wii balance board has shown they can move into actual exercise, real movement of real muscles. So think of Project Natal and alike providing a physio therapist the ability to remotely instruct on exercise with a good degree of feedback on actual performance of the patient, kids to rehearse their dance moves for upcoming shows with one another in different schools, an emerging science of remote body language (do we use the same signals as we do in real life when instrumented in this way). The list goes on. Of course this can also still work sat at a desk, pointing at things, handing things to one another and mixed with traditional communication media. This is showing the way leading to some new interaction paradigms for people. It is also very real. There may be the odd bit of hype but we are now getting several generations into the technology. Next it goes mobile and we have full AR in a consumer package. How exciting is that !